Konoha is said to have a long history and is one of the strongest villages. As other answers have stated, we do not know enough of the entire history to pinpoint exactly how old Konoha is, but we do know some time frames to narrow it down. It would appear Konoha is younger than it appears, and I would say Konoha is no more than 80 years old in Shippūden and barely 100 years old in the Boruto series. These timelines are not 100% accurate due to guesstimating, but they’re pretty close in regards to the entire timeline as a whole and all 3 points of view line up to support each other. The war started not long after the system of one shinobi village per country was established by the founding of Konohagakure after the Warring States Period. Ok, we have a start. All it says is "not long", so I would put this time period no more than a few years. During the period of the Warring Ages and the First Shinobi War, as shown in Chapter 619, Hashirama was alive when Tsunade was very little. I would say she is roughly 6 years old at this point. At this point, Konoha is ~10 years old. Next comes the Second Shinobi World War, taking place 20 years after the First Shinobi World War ended. Even then, the peace only lasted another twenty years until the Second Shinobi World War erupted. Based on the First War's wiki, the final moments of the war mimicked the actual World War I, which leads me to assume the First Shinobi War lasted 4 years. The conclusion of the First Shinobi World War mirrors the events that followed the real-life First World War. World War I was ended with armistice, before a treaty was finally signed. ... Nevertheless, within twenty years after the signing of the treaty, World War II would begin. 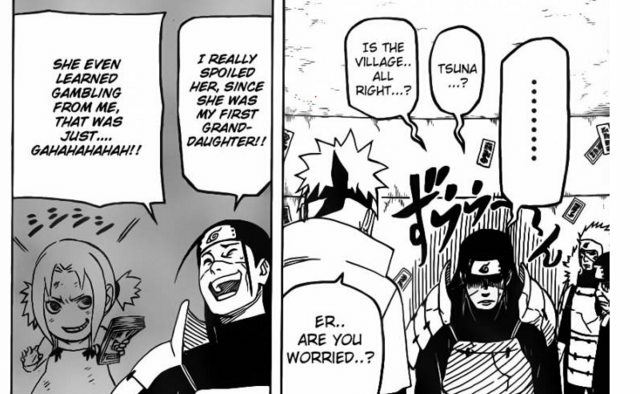 If we account for that timeframe, this puts Tsunade at ~30 years old during the events of the Second Shinobi War. At this point, Konoha is ~34 years old. At this point, Konoha is ~59 years old. The Sarutobi clan was one of the first clans to settle in the newly founded Konoha, to which Hiruzen was one of the first generations to come it and even be trained by the First Hokage himself. This means Hiruzen was alive, but young during the founding of Konoha. Using the same deduction as earlier, Konoha is ~10 years old at the start of the First Shinobi World War and during this war, Hiruzen is appointed to be the 3rd Hokage by the 2nd Hokage. Furthermore, based on his wiki, Hiruzen was 68 years of age at the start of the series, which is 17 years older than Tsunade at the start of the series. Based on the guessimated age of Tsudande from the above, Hiruzen is only 23 years old during the First Shinobi World War, which (again) starts not very long after the found of Konoha. At the time of Hiruzen's death, it is stated that he is 69 years of age, which leads to the assumption that he maintained a life of 46 years after being appointed as the 3rd Hokage. If we add the starting ~10 year span at the beginning, Konoha is ~56 years old. Kakuzu is the oldest known shinobi who age is known at a whopping 91. Trivia: Kakuzu is the oldest shinobi whose age is known. Kakuzu originated from the village Takigakure, and during the founding of the villages, he was sent to assassinate Hashirama. This puts the timeframe of Kakuzu’s battle with Hashirama and Kakuzus death anywhere between 50 - 70 years. As mentioned in the comments, Konoha was founded by Hashirama Senju and Madara Uchiha. It is difficult to pinpoint the exact age of Konoha. According to Narutopedia, Konoha was founded right after the Warring States Period. The Warring States Period being a time when the countries of the world were uniformly small, constantly battling each other for land, power, and opportunity. During this period, the Senju and the Uchiha emerged as the strongest clans. The war was ended after the two clans united. However, we do not know any concrete chronological information of that period. The age can be estimated though, guessing at ages of all the Kages all the way back to Hashirama Senju. The wiki doesn't seem to provide and accurate account of the ages of the Kages or the village either. I believe that is just as close as we can get to it. My guess is, it has to be around 150 years if not a little more than that. Adding up ages of the Third (he died while serving) and a few years from the life of the Second (he was already an adult when Konoha was found) should make roughly a 100 years. Adding up Naruto's age and all, it should add another few years but not more than a 50 (just a guess). So the village should be more than a 100 years and less than 150 years old. Konoha was founded during the warring clan era by Hashirama and Madara. Now, to have the power and get acknowledged by the other clans to create Konoha, they have to have been somewhere between age 25 to 35. Hashirama's brother, the 2nd Hokage, would have been around the same age too. In a flashback, we can see that the 2nd Hokage was just around 30 years old when he was killed by the Gold and Silver brothers. And the 3rd Hokage has been his disciple since being a genin. From this, we can say that Konoha was created just around the same time as when the 3rd hokage was born. And he was 68, I think, when he was killed by the Snake sennin. Add another 30 years when Boruto takes place. Add some 5 years for the 1st Hokage's term. Add another 5 years for 2nd Hokage's term. Add around 55 years for 3rd Hokage's term. And another 5 years for 4th Hokage's term. (Naruto Shippuden starts) Then add 30 years for the skip to when Boruto takes place. So totally Konoha is around 110 years old. How did the people in the Naruto Universe forget about their history? When did the Kin/Gin Brothers get their Nine-Tails power? Do we know how old Kakashi is? How does an outsider get “citizenship” in one of the Five Great Shinobi Countries?